Most garages end up looking like a trash heap. That’s where you throw things when you don’t know where else to put them. That margarita maker you got for Christmas but you only trot out at occasional parties? In the garage. That nail gun you bought when you thought you’d put up your own crown molding (before you ultimately called a professional)? In the garage – somewhere. You end up with boxes upon boxes that have who knows what in them and piles of tools that become too jumbled to actually find what you need. Getting the space organized will not only make it look better, but it will also make it easier to find what you need. In the process, you’ll make the garage look bigger and give yourself more useable space. While you have everything pulled out, it’s the perfect time to clean up your garage and update a few things. Go ahead and paint the walls if you have finished walls. Patch any holes in the walls or ceiling. Clean up any oil spills. Get rid of any trash that has just been piling up in the corner. Also consider getting Peoria epoxy floor coatings. They will give the floors a nice, glossy look, and they will protect the floors against stains and other damage. While cleaning and updating your garage won’t really get it better organized, it will make the space look cleaner and more orderly, which will contribute to the overall impression of organization. Plus, if one of the perks of organizing your garage is that it will give your property and your belongings more years of use, then you should consider these updates for the same reason. Organizing your garage is a bit like moving. First, you have to pack everything up – or pull everything out and sort it into groups. Then you have to unpack – or put everything back in its new home. To make the second part easier, you should make a plan of where everything will go. Be sure to think about how to use your things when making your plan. For example, you will probably use lawn and garden items frequently, so these things should be easy to reach and close to the door. Your plan doesn’t have to be fancy. Just draw up a simple floor plan and indicate what items will go in what areas of your garage. Then refer to the plan often as you put things back in their new space. Before you can organize things, you need to take stock of what you have. Start going through those boxes and unjumbling those tools. While you are sorting, start putting boxes and other items in piles and groupings of like items. So, put all the gardening tools in one spot, all the boxes of holiday décor together, and so on. For any extra clutter your garage has acumilated over the years you could move in into a storage unit. Call A to Z Valleywide Movers if you need any help with packing or moving your iteams. Also while you are sorting, take out the things you no longer need. Donate everything you can and then recycle or trash the things you can’t. Make sure you properly dispose of things like motor oil or paint. You can’t organize your space without the right garage cabinets and other hardware. Otherwise, you’ll just have orderly piles of boxes. That’s less chaotic than what you might have now, but it certainly isn’t organization. Consider investing in some quality garage cabinets like Slide-Lok. These popular cabinets are specifically designed for garages, and they have multiple configurations so you can get exactly what you need to organize your garage. 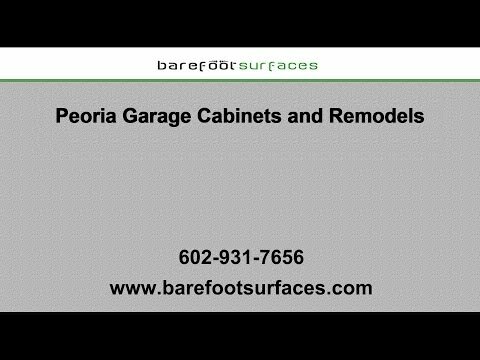 With garage cabinet installation in Peoria, you will instantly create orderly space for your belongings, and you’ll keep them out of sight. Garage shelves and hangers for things like yard tools or bikes will also help you organize your space. Use all the available space you have, including high on the walls and the ceilings. For example, you can mount a hanging shelf from the ceiling on which to put totes or boxes. Don’t waste any time searching through totes or opening cabinet doors to try to find what you need once you’ve organized your garage. After all, the point of organizing is to make things easier to find. The best way to keep things in their proper place and to help you find them quickly is to label everything. Put labels on every box, every shelf, and every cabinet door. There will be no question of where to find the thing you need. Stop dreading every time you have to walk into the garage. Clean it up, upgrade the space, and organize everything. You’ll be able to find what you need quickly, and you’ll actually like spending time in your garage! Barefoot Surfaces can help. We install garage epoxy floors and are approved for Slide-Lok garage cabinet installations. Our epoxy floor coatings in Peoria will make your garage look beautiful again, and the Slide-Lok cabinets will help you have a place for all your tools and other belongings in your garage. We serve clients throughout the Phoenix Valley Area in Arizona. Check out our gallery of work online then give us a call for an estimate. We have references throughout Arizona ready to rave about the quality of our work.